If there is something that can be used both for floor covering and wall décor it has to be an Oriental rug. Because no one has ever walked on paintings. Oriental rugs are a synonym of the best crafts when it comes to carpet making. Ancient, antique medium and new Oriental and Persian rugs or kilims can fit perfectly with modern home décor ideas. related to the place where this carpet will be put. No matter if it is going to cover a floor or a wall, it has to be a spacious chamber. The perfect place would be a large mansion decorated in a minimalistic way and with a large square or round carpet that comprises no more than eight colors such as beige, blue or navy, gray, white, burgundy, brown and green. These are considered as neutral colors that can be paired with furniture, plush architecture, and spacious rooms. Generally, designers try to put a highly valuable object or piece of furniture at the center of attention. In the case when this object is Persian carpet, every other detail in the room will depend on the carpet. When the carpet is the most expensive and at the same moment the most preferred item in the room, then keeping patterns in the same color family. Paintings, pillows, fabrics and other objects can have similar colors as the carpet. Another idea wouls be to keep the room monochromatic. It would be a good choice if you want that all eyes on the rug. A complementary scheme is a great solution to interior design when you have a large floral carpet. Mixing patterns can be delicate, but there will be no problem if you have the right carpet. Give some room to nomadism in your house. Nomad rugs can be the earliest form of rug experimentation. However, nomad rugs have the peculiar trait that makes them seem like they are coming from the future. They include designs that have been handed down through generations and still fit the most extravagant home décor ideas. If you are on the wave of the Art Nouveau design styles try a Chinese art deco carpet, a Moroccan rug or a kilim. These carpets feature designs and combination of colors that look so modern and match even with contemporary or avant-garde styles of design. 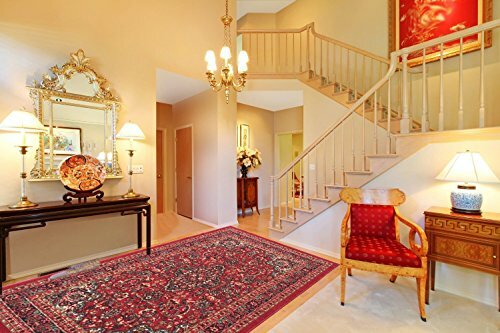 « How to Clean Oriental Rugs at Home?